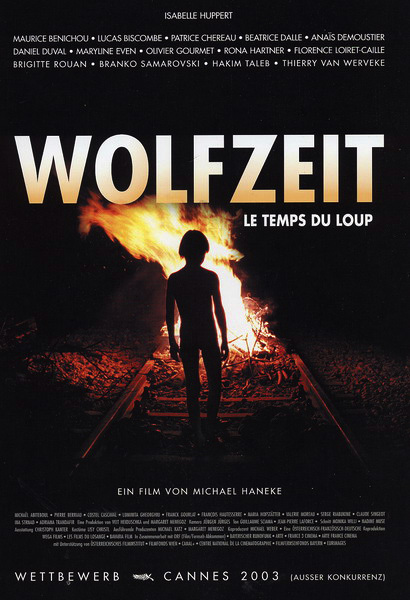 Cast: Isabelle Huppert, Lucas Biscombe, Anaïs Demoustier, Hakim Taleb, Maurice Benichou, Patrice Chéreau, Béatrice Dalle, Thierry van Wervecke u.v.a. The time preceding the apocalypse, when all values disintegrate and the highest becomes the lowest, is known in Germanic mythology as the time of the wolves. Fleeing a disaster, a middle-class family (father, mother, two children) travel from the city to their private countryside refuge, believing themselves to be escaping the consequences of the general state of chaos.